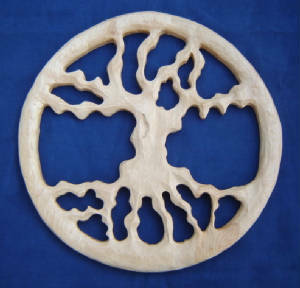 Individually carved from solid Cherry wood (shown), or Black Walnut. Approx. 9" across by 3/4" thick, with a keyhole slot routed in the back for easy wall mounting. Individually carved from Black Cherry. Approx. 9" across by 3/4" thick. Has a keyhole slot in back for easy hanging. 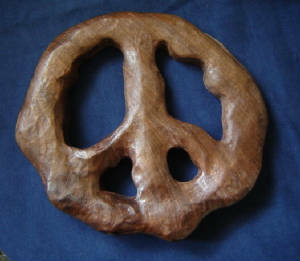 Individually carved from Black Walnut. Approx. 8" across by 1 1/4" thick, with a lacquer finish. Keyhole slot in back for easy hanging. 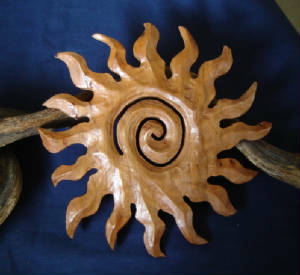 Individually carved from solid wood. Approx. 17" diameter by 1" thick. Has a keyhole slot in the back for easy hanging.